Our eyes are crucial to hitting a baseball, kicking the winning goal in a soccer game, throwing a first down pass to the wide receiver, or whacking a racquet ball into the wall to score a point. Our sight is an important factor in playing sports, but many sports also put us at risk for eye injuries, so it’s important to be aware of sports eye safety.90% percent of all sports-related eye injuries could be avoided by using protective eyewear. It is important to understand that safety eyewear does not include the standard prescription glasses you may get for being nearsighted or farsighted nor does it mean that only children should wear eye protection.There are many forms of protective eyewear including safety glasses, goggles, safety shields, and eye guards. 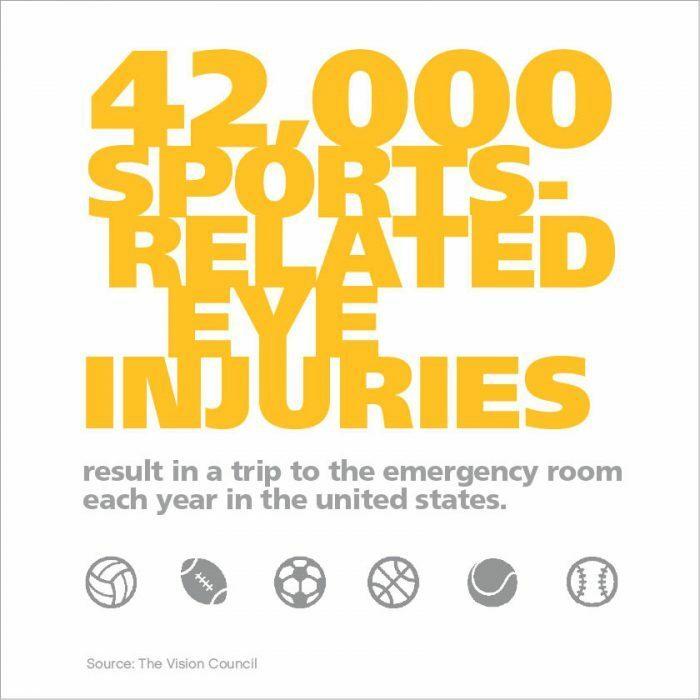 If you are interested in better protecting you and your family’s precious eyes, please be sure to reach out to your provider for more information on the correct safety eyewear for the designated sport or activity you participate in.The chart below will show the sports with the most risk for eye-related sports injuries.